Knight is at peace with his decision to leave "Grey's Anatomy"
Knight concluded that his character George had "expired"
(Entertainment Weekly) -- Fans were shocked when T.R. Knight made the surprising decision to leave "Grey's Anatomy," the hit medical drama that launched him to fame. T.R. Knight's character appeared on "Grey's Anatomy" for less time than the previous season. This week, in an exclusive interview with Entertainment Weekly, the actor reveals what led him to his decision, and he also candidly discusses "Isaiahgate," coming out of the closet, and leaving his friends at Seattle Grace. 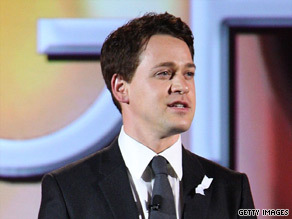 This fall, Knight was surprised to see his character George O'Malley all but vanish from the show -- for the first nine episodes of season 5, he appeared on screen a total of only 48 minutes, compared to 114 for Sandra Oh's Christina. Still, due to what he calls a gradual "breakdown of communication" between himself and exec producer Shonda Rhimes, the actor chose not to ask his boss what was going on with his character. Instead, he simply asked to leave. "My five-year experience proved to me that I could not trust any answer that was given [about George]," he explains. "And with respect, I'm going to leave it at that." Though he was unknown when Grey's premiered, Knight soon emerged as one of the breakout stars (and even earned a supporting actor Emmy nod in 2007), but it was what came to be known as "Isaiahgate" that would catapult him to household-name status. After Isaiah Washington referred to Knight as a "f----t" during an on-set argument with co-star Patrick Dempsey, the tabloids caught wind of it, Knight came out in the press, and Washington was fired. While Knight doesn't specifically fault Rhimes for how the situation was handled behind the scenes, he says the exec producer was among those who tried to discourage him from coming out: "I think she was concerned about having my statement come out so close to the [initial] event." Rhimes denies this: "I said, 'If you want to come out, that's awesome. We'll totally support that.' And then he went away, thought about it, and came back and said, 'I'm going to make this statement.' I remember saying to [fellow executive producer] Betsy Beers, 'This is our proudest day here. T.R. got to come out, and I got to say to him that it wouldn't affect his character' -- because he was concerned that he was going to come out and George would suddenly be gay. I was like, 'We are not going to do that.' The idea that a gay actor can't play a straight man is insulting." Knight returned to work on season 4, but the actor struggled with the story line in which George cheated on his wife Callie (Sara Ramirez) with Izzie (Katherine Heigl). And once George went MIA from the beginning of season 5, the star came to the conclusion that his character had "expired." Today, Knight is at peace with his choice to leave: "There just comes a time when it's so clear that moving on is the best decision," he says. But at first, his castmate and friend Heigl tried to talk him out of it. "I didn't think it was the right decision," she says. "I felt like some of the problems could be worked through. But by the time it came to fruition, I was [glad] for him because he was ready to go." Knight knows he's taking a risk walking away from his top 10 show and $14 million contract. "From an outsider's perspective, I get the [impression that] 'He's just a spoiled actor...he doesn't know how good he has it,'" he says. "There are a lot of people who would like to be in my position. But in the end, I need to be fulfilled in my work." For more on T.R. Knight -- including how he felt when George was back-burnered, what he really thought of the "Gizzie" story line, and where you can see him next-- plus what's in store for the other docs on Grey's Anatomy, pick up the new issue of Entertainment Weekly on stands Friday July 24.